THIS COMPETITION IS NOW CLOSED. WE HAVE ANNOUNCED THE WINNER HERE. YOU CAN SEE OUR CURRENT COMPETITION HERE. This week we’re offering this vintage boho amber necklace, thanks to The Stellar Boutique. 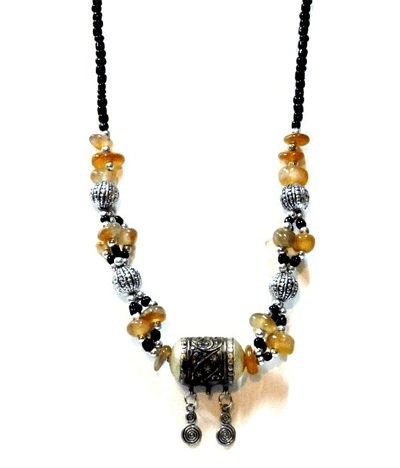 This vintage 1960s necklace is made from polished amber stones and metal beads and fastens with a hook & eye clasp. It is in very good vintage condition and measures 11.5in length from clasp to bottom of necklace (approx 23 inches in total). For your chance to win the necklace simply pick your favourite item from The Stellar Boutique and let us know what it is in the comment box below. For an extra chance to win, you can also post your answer on The Stellar Boutique’s Facebook page. We’ll pick a winner after entries close on Thursday 5th April The winner will be announced on this blog soon afterwards so don’t forget to check back or subscribe! this small little ceramic deer, in my magical house of the future I want one room to be entirely kitsch, like walking into a mythical snow white forest fulla kitsch stuff, faux grass on the floor EVERYTHING, and I would have lots of little miniature animals like this one! beautiful kitsch and vintage item and unlike anythign Ive seen quality wise ! What a gem of a shop … Couldn’t decide which is the favorite … After much oohing and aahing, this 60s vintage doctor’s bag (http://www.thestellarboutique.com/60s-vintage-doctors-bag-999.html) is my absolute favorite! spotted this gourgeous ring, a timeless piece that would go with any outfit, can’t go wrong with this one. Plus blue is my favourite colour! This is a MUST HAVE – how cool!! Me wanty! All those items are really pretty! Thanks for the giveaway! The necklace prize is gorgeous! I also adore this gorgeous the Shifra dress http://www.thestellarboutique.com/shifra-dress-136.html and think the necklace would match it nicely! I love the 70s vintage ‘Bottazzin’ boots! I’d love to strut my stuff in those! This brings back memories. I used to have my own – back in the day. 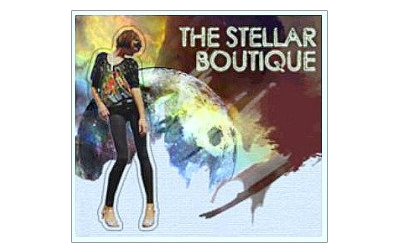 the stellar boutique site is fantastic, and the necklace too!!! chunky boho slipper socks – afgani’s we used to call them- i can’t believe it- i used to have a pair- so many years ago- but haven’t seen any for AGES! Moroccan coin necklace is definitely my favourite! – and a great price too! 70s vintage brown briefcase wow what fab bag. I love this Vintage Brooch – very suitable for Jubilee Year! Everything is so beautiful. I love the 40s vintage military box bag! a statement ring which has been sold or id have ordered it! This necklace is my favouite piece. I have always liked Amber and I love the vintage style. It reminds me of dressing up when I was little and borrowing my Mum’s necklaces. i like the quilted denim chain bag. Ageless Elegance – as always! Wow i love this necklace and i think it would go wonderfully with my favourite which is the http://www.thestellarboutique.com/dahlia-lace-dress-cream-473.html. How pretty, I love amber! From the site, I adore this: http://www.thestellarboutique.com/silver-bangle-with-large-green-amber-stone-zaena-307.html So beautiful! I like the vintage compact, antique gold and floral – it’s quite beautiful. I love the vintage hornet brooch it is exquisite! i really like the one shown at the top of this age, looks so unique. Maggie + me festival jacket = Lush!!! The pink 50s vintage beaded gloves are my favourite (after the lovely prize necklace) as they take me back to the days in the fifties when my friends and I would wear gloves like these to go with our full skirted summer dresses. The sixties, which were a lot more fun, put pay to such niceties! I adore the 60s vintage crochet tassel bag. 60s vintage Afghan turquoise ring is my favourite thing. I love this necklace it would go well with the new outfit i bought at the weekend. I just love the Maggie + Me fringe jacket – lovely to look at and so useful! Vintage White Rhinestone Drop Pin is my favourite. Such a hard decision to make, however these beautiful vintage beaded gloves do it for me!!!! I love this, would wear it with a punky leather jacket and studded pumps to keep it modern and me. http://www.thestellarboutique.com/moroccan-turquoise-bead-necklace-904.html I love this, but I love what you are giving away even more! WOW! what a collection the hollywood cowboy brooch is fab-u-lous! http://www.thestellarboutique.com/turquoise-silver-necklace-195.html this is my fave item! though there are many other items i desire…. It’s so cute and I’m feeling all summery this week! and I’d love to win!! I love the 80s style floral dress! My fave is the 1940s vintage rucksack. I love all things 40s and 50s, and love vintage fayres and re-enactments, I love steam trains and this would look great with a tea dress aboad a steam train! I love the vintage satchel as I love all things 1940s. Would look great with the necklace, a tea dress and a day on a steam train! Brown leather Boho bag with plaited tassels. I love the Large Moroccan silk throw stripey – So much colour, and would go perfectly with our tangerine bedroom. Oh god – I am tormented over this Doctor’s Bag http://www.thestellarboutique.com/60s-vintage-doctors-bag-999.html – perfect for a goth-rick chick like myself……ahhhh if only it it were payday! 80’s vintage quilt chain bag is beautiful! I love this : http://www.thestellarboutique.com/50s-vintage-floral-dress-sold-426.html, so pretty! Wow-Sellar Vintage is packed full of Vintage yumminess……my personal fave is the pair of 70s vintage ‘Bottazzin’ boots! Vintage gorgeous!!!! The vintage boho amber necklace is fab! 60s vintage Afghan turquoise ring definitely stood out for me. It’s a shame it’s sold out. oh this site really took me back!! i love the kaftans, especially the black one. so useful and reaxing. I absolutely love this necklace: http://www.thestellarboutique.com/60s-vintage-green-malachite-boho-necklace-961.html . It fits perfectly my love of all things green! My fave is the Maggie + me pansy playsuit! this is stunning. a beautiful summer piece! Oh there are so many gorgeous pieces there… if I had to choose one it would be the Moroccan Turquoise Bead Necklace. This is really nice too http://www.thestellarboutique.com/friis-company-large-cream-studded-handbag-615.html Love bags! Friis Company fringe ankle boots – they take me back to the 80s! This necklace looks lovely, would compliment many outfits that i currently wear. i would love to buy the large red Morrocan throw for my bedroom as it would compliment my room and make it feel more plush. Thank you so much for this gorgeous giveaway. This necklace is stunning! My favourite item on The Stellar Boutique is the 70’s vintage sun dress in red and white floral print! Some very pretty and unusual stuff on there. I particularly like the Friis Company Statement necklace in silver & gunmetal. It’s stunning! The dusty rose sundress is a RUNWAY success, ideal for a night on the GOWN or any DRESStination! what a great site , i will deffinately be having a good look at all of the great stuff i like the dusky rose sun dress that could be in my holiday suitcase. love http://www.thestellarboutique.com/friis-company-chunky-chain-necklace-412.html its nice a bright and would liven up any outfit.